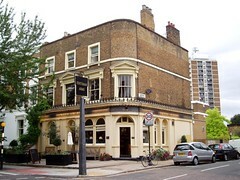 A gastropub between Vauxhall and Oval stations. The pub may be surrounded by a lot of low-slung council estate housing, but clearly there's an upmarket crowd (apparently including plenty of Antipodeans) willing to sustain this bit of gastropubbery tucked away in South Lambeth. Even on a Tuesday, the place quickly filled with people, though this may be explained by a pub quiz on Tuesday evenings (starts at 8pm). At 7pm, there were still a couple of tables available inside, as well as an extensive beer garden photo, the raised part of which was under awnings. There are three ale handpumps, offering London Pride and Sharp's Cornish Coaster (the other one appeared to be off, on our August 2008 visit). There are also draught lagers (Star, Leffe, et al.) and Aspalls cider. The focus, though, is on the extensive wine list, which uses descriptive categories to break it up. Large glasses ranged from £5 to about £7 for the pricier wines. There is a small dining area just at the back of the main room with about 15-20 covers, looking out on to the extensive beer garden. Food is served noon-3pm and 7pm-10pm Monday to Friday, noon-4pm and 7pm-10pm Saturday, and noon-4pm and 6pm-9pm Sunday. The food covers familiar gastropub staples, with one vegetarian option (on a visit in August 2008, this involved baked goat's cheese), though there are a number of other pub basics on the separate bar menu (for example, vegetarian tacos, and hoummus & pitta). There is also a specials chalkboard, which offered a few more mains. Ewan had a chickpea cassoulet from the special board (£9), which was a lot tastier than it initially seemed, with a rich buttery sauce. The buttery mange tout (£3.50) on the side weren't as buttery as their billing suggested, and quite al dente. Jo had hoummus and pitta (£5) which was perhaps a little pricy for the two pitta cut in half and bowl of hoummous, but still perfectly nice. Service was initially confusing -- they indicated there was table service for the food, but neglected to come to our table (we were sitting outside) until prompted again. However, once this was resolved, they were friendly and prompt. There is an upstairs room which didn't appear to be open on our visit and can be booked for functions. Last visited by Ewan and Jo, 19 August 2008. Opening hours and food times taken from website, August 2008. Last edited 2013-07-15 16:26:37 (version 8; diff). List all versions. Page last edited 2013-07-15 16:26:37 (version 8).